With over 15 years of experience in tour operation, it’s safe to say we’re the experts. City Wonders is the only Official Vatican Partner and for over 12 years we have provided the most exclusive and engaging tour experiences for this iconic institution. You may have heard of other Vatican “Partners”, but we are the only tour operator that has the highest partnership status available. A status that means we get YOU in faster, earlier, and to areas most people never see. It’s a once in a lifetime opportunity to see the Vatican, don’t waste it by choosing a standard tour operator. Over 200 tour operators have “Skip-the-Line” entry to the Vatican, which can mean a wait of 45 minutes or more. We are the only Official Partner, and that means you get to use our Private Partner Entrance, which allows you to enter immediately! Ever imagined having the Sistine Chapel all to yourself? Our First Entry to the Vatican allows you to get in 30 minutes before any other tour operator and 1 hour and 30 minutes before the general public. Our status as a Vatican Partner also allows you to access normally off-limits areas like the Bramante Staircase and enjoy unique experiences like breakfast in the Pinecone Courtyard or a Night Tour of the Sistine Chapel. No matter how you want to experience the Vatican, we have an option for you! From specially-crafted family tours for your little ones to night access for a less-crowded view of the museums, we have the widest selection of tours, times and itineraries. We’ve been in business more than 15 years, guided more than 1.5 million people through the Vatican and have the No. 1 Booked Tour in the World, so we’ve learned a thing or two during our time! Choose us to experience the Vatican with experts. 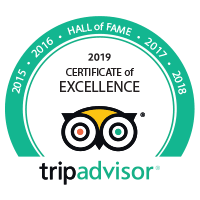 25k 5-Star Reviews We’re the highest rated, best-loved Vatican tour operator, and our reviews prove it! From expert guides, to a highly-curated route through the museums, we always provide 5-Star service to our guests. Take a tour with us to find out why we have thousands of 5-Star reviews on TripAdvisor!